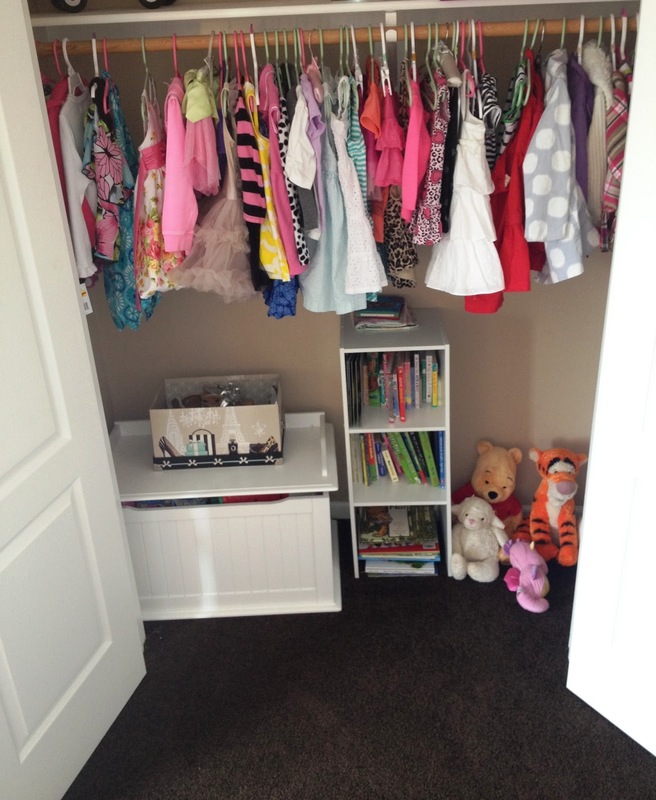 As I mentioned in my previous post Neutral Nursery Decor, when I found out Avery was going to be a girl I went on a shopping spree for nothing but pink, green, and all things girlie and shabby chic. I didn’t want her room to feel like it was bought out of a catalog so I ended up using both new things and vintage items I collected from family and an antique shop in KC called Good JuJu to make it unique for my one-of-a-kind Princess. When Avery was about 18 or 19 months old she started crawling out of her crib every night so we knew she was ready for a big girl bed. Rather than purchase a toddler-size or twin bed, we simply switched the crib with one of our queen guest beds and converted a guest room into the nursery for the new baby, leaving Avery in the same room she has had since day 1. I decided to use the pom poms I bought for her 1st birthday party as permanent room decor rather than just storing them for who knows when. 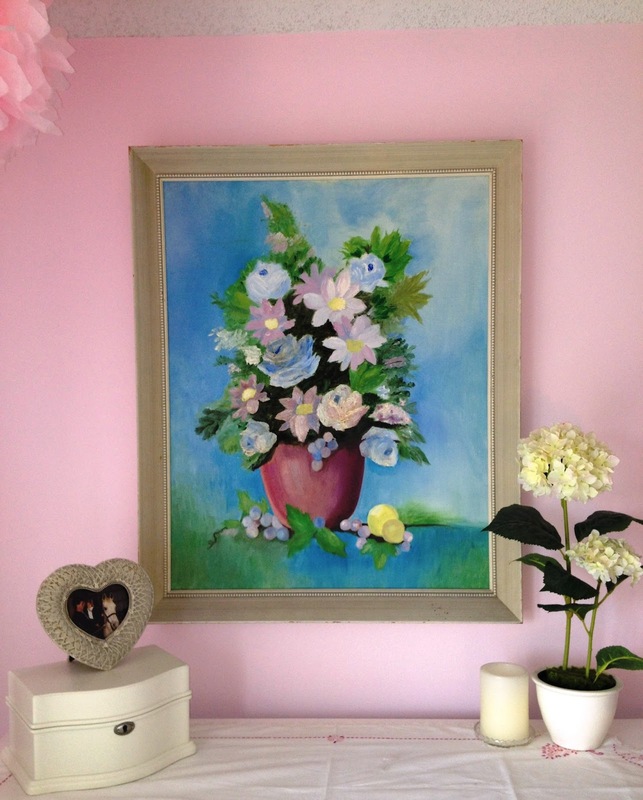 This painting is another vintage find. My grandma was cleaning out her basement and asked me if I wanted an oil painting that my mom did in the 60’s. I love that it’s so personal and one of a kind! I purposely keep the toy box and bookshelf (both from Toys ‘R’ Us) in the closet so during nap time I can just close the doors and hope to take away some distractions. All her little shoes are in the craft box so I can grab them quickly on the way out the door. I talked about this in my nursery post as well, but it bears repeating; I personally think traditional end tables are a waste of space and money. It’s better to look in the bathroom decor section to find something that can double as a storage unit. This one is from Home Goods. Since the changing table has moved to the nursery, I keep all of Avery’s diapers in this end table and just use the bed as a changing space. 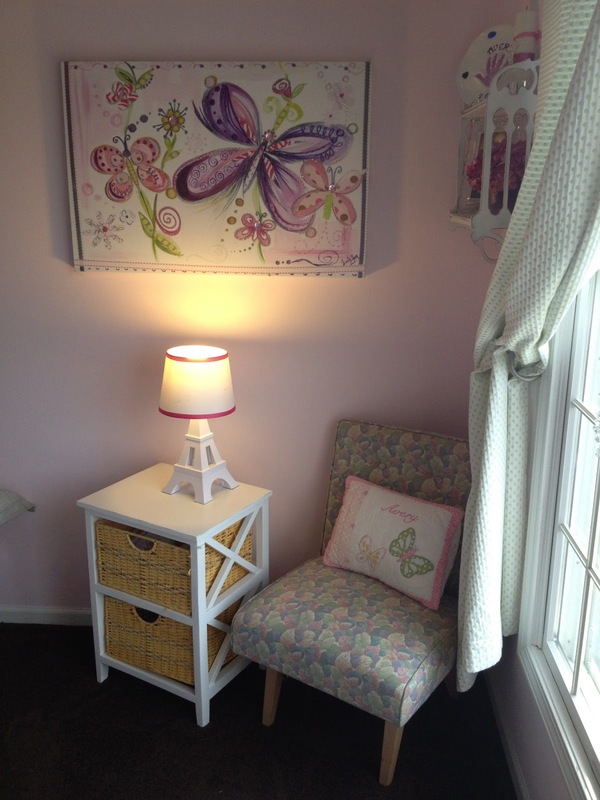 The chair and wall shelf are vintage and the customized pillow is from Pottery Barn Kids. 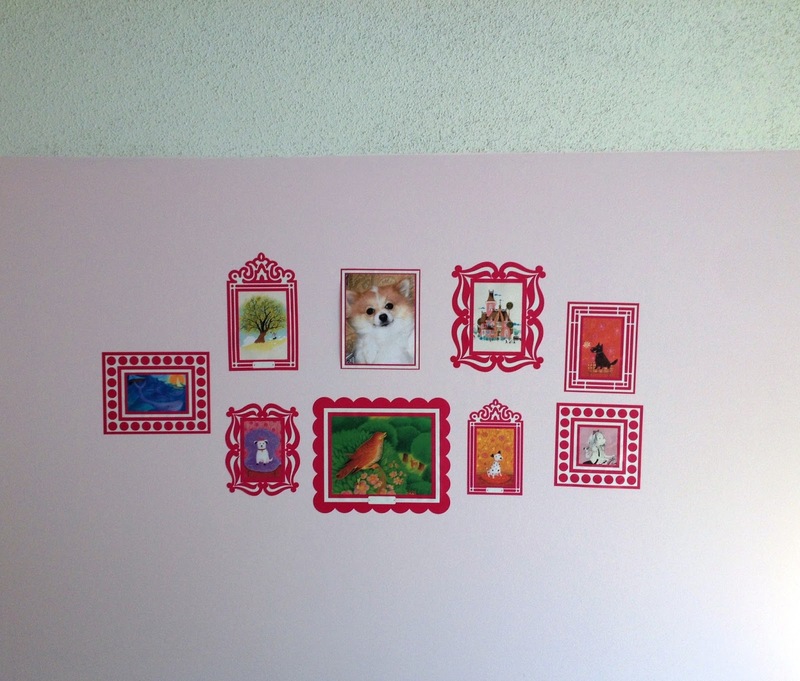 I wanted to put something above her bed that wouldn’t be at risk of falling so I found these stick-on frames at Bed Bath and Beyond. I used some of our favorite book illustrations for the decor and of course put the crown jewel, our dog Audrey, in the center. All in all it probably took 15 minutes from start to finish and cost maybe twenty dollars. Love that! The crown decal is from Target. It originally came with a stick-on phrase that read “drama queen” which I think is beyond tacky so I tossed that part. 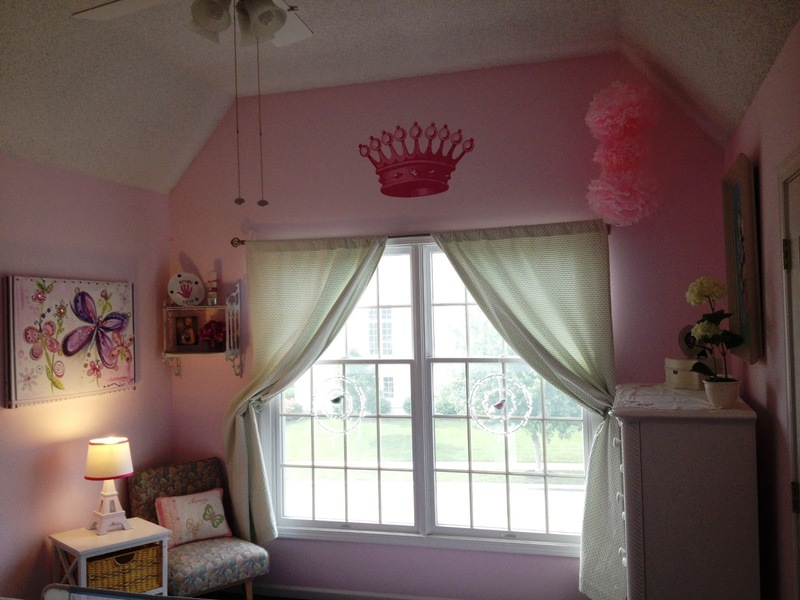 The crystal dream-catchers in the windows and the green and white polka dot drapes are from Pottery Barn Kids. 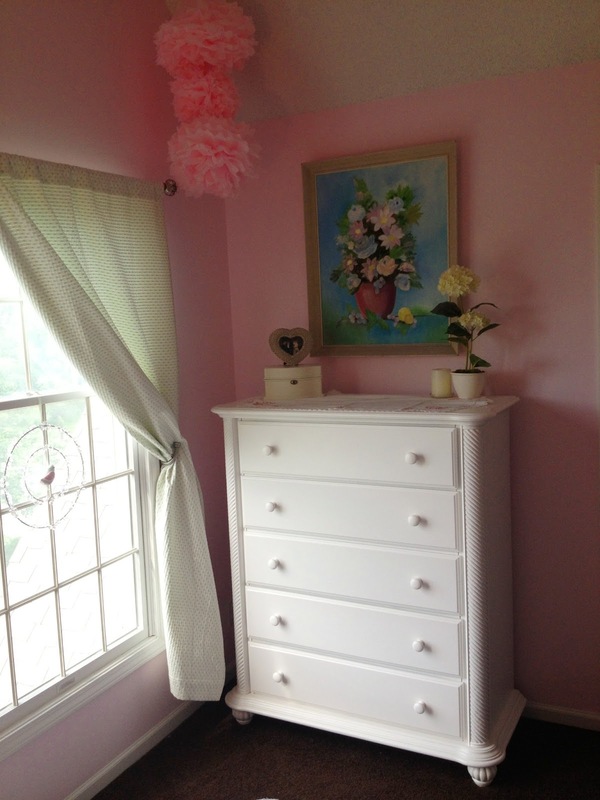 So that’s Avery’s little shabby-chic, pink and green, eclectic and girlie, comfy cozy toddler room!